Irwin Mushpot entered the dank basement office with some trepidation. He seen answered the ad for a romantic profile writer online. He’d always wanted to be a professional writer, he sent things into publishers, but he never heard anything back, not even a form letter. When he’d filled out the writing test this time, he’d gotten a response almost immediately. A Mr. Albert E. Ayne had sent him an e mail back requesting that he meet him at his office on NE. 82 St.
An elderly secretary greeted him and lead him to a very small room which contained a desk and two chairs. “Mr. Ayne will be with you in just a moment, the secretary said a bit to sternly for Irwin’s tastes. After a moment Irwin saw the door swing open, but he did not see anyone come in. He heard tiny footsteps and looked down he saw what appeared to be a half man half possum making its way across the floor. It climbed up a small rope ladder that was attached to the other side of the desk. It sat across from Irwin and smiled. Hello, you must be Irwin, I’m Al,” the creature said in a strange buzzy voice. “It’s a pleasure,” Irwin said extending a hand trying to act normal. “Thank you,” Irwin said, a bit flattered in the face of the shock. “Um. Let’s see,” Irwin said fumbling with his notebook. Millions of questions raced through his head, but none seemed appropriate. Irwin wondered if that was supposed to be a racial comment. “When you say petite, what, like um height and weight did you have in mind?,” Irwin asked wondering if Al wanted someone his own size. Al’s cell phone burst out with I Think Were Alone know, by Debbie Gibson. Al hung up. He seemed agitated. “Human not over 40. She should be a non-drinker, that’s very important! I would prefer an only child who is herself childless and when we go on our date she should not have eaten for 12 hours. She should have no digestive problems. I mean I don’t like those anorexics.” He said bouncing around. “Do you want me to use a picture of you sir,” Irwin asked delicately. AL turned and looked out the window suddenly he leaped up and jumped on the curtain he began pulling it shut with his paws, his hand and his teeth. “Um, do you need any help,” Irwin asked. “No,” screamed in a shrill voice. He finally got the curtain closed. As Irwin was leaving he noticed the shadow of a large circular vehicle in the parking lot. He walked out the back door and walked around to the front to get in his car. He drove around the building, but the vehicle was gone from the parking lot. 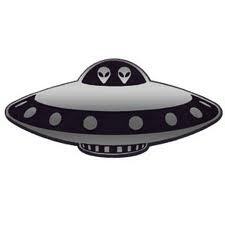 He looked up at the sky and saw a strange object with a familiar arm hanging out of the window.